This article was published by Adam Ismail (@glassjaw) on April 8th, 2019 in the Features category. I followed the later stages of the development of this game, & bought it upon release. I remember some developer boasting that they weren't competing with other games, but with the actual TV show! It was a firm favourite of mine at the time, & I used to play the rally in-game after I watched the real thing on TV. Sebastian Loeb said he used one of the games to practice for the Australian rally, which was new at that time. He went on to win it. I thought the physics were ok at launch, & was hoping that they would get more real as the series developed. However, I was very disappointed with the second game, & by the time the third game came out the physics were just bizarre, to say the least, & it got returned. It ended up being more of an arcade game than a proper sim. I feel like I say this with each new Mirror Mode article, but this is your best work yet @glassjaw! I think you touch on a key attribute here: that realism needed to have a more creative approach back in those days. I’m a firm believer that limitations improve work approaches. A classic example is Mario’s original design being dictated by the power of the NES at the time. 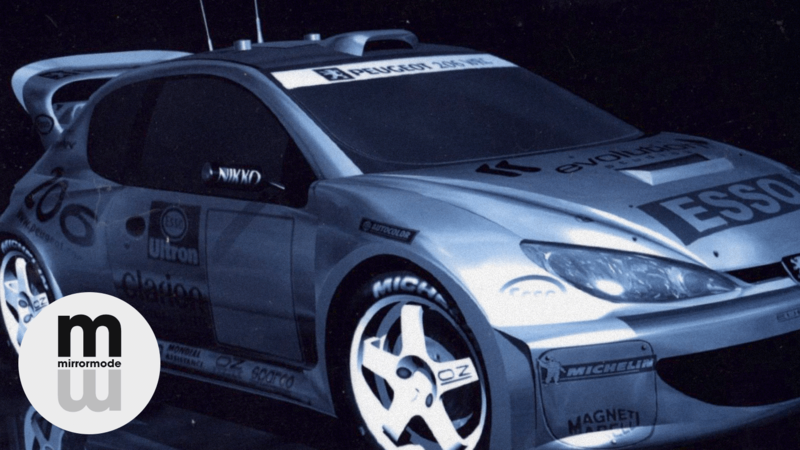 Evo looked to remind people of WRC in a different way than just throwing computing power at the physics engine. I’m not saying today’s hyper-realistic sims are worse for that focus, but I think many would agree the feel is generally “dryer” in comparison. There’s something to be said for the spirit of the thing, regardless of the raw numbers. Lilium, MrCrynox, Mr Fahrenheit and 3 others like this. I remember this game fondly. It came out when I was in 1st grade, but I bought it in 3rd grade from my local Blockbuster. I remember being confused as to why one of the Focus WRC drivers was named "Ford Driver," I remember launching the Subaru WRC car of the cliffs of Monte Carlo, flying down the Finnish stages in the fugly Skoda Octavia WRC, meandering through Rally Kenya, and trying (and failing) to conquer the last two Rally GB stages, both of which were totally pitch black, and almost necessitated the use of the hood/bumper cam. Nowadays, the game doesn't hold a candle to modern rally titles, but it still holds a special place in my heart. It was by far the most challenging racing game I owned before I turned 10. The intro will always be one of the best racing game intros for me. It’s up there with Gran Turismo. glassjaw and MansellsTash like this. I adored these games. Well, at least 1-3 anyway. I remember being in awe and the draw-distance in the later iterations as that was a pretty new "thing" back then, at least on console anyway. Those were the days I would always actually watch a replay of my stage if I'd hooked it up well. Also, Soulwax's "Much Against Everyone's Advice" seems to stick more in the memory than the Faithless track for me. I only owned WRC2 Extreme, although it was a reasonably polished and it had the official licence the physics were pretty poor and at times glitchy. The graphics were also pretty basic especially compared to CMR3 and the rally mode in GT3 wiped the floor with it visually. It was good though how it mirrored the ITV coverage at the time with the same commentary, course info, fmv segments etc. For me, WRC Evolved had the best features and ideas but fell short on stage count. Such a shame as it has so much character. Yeah, I think you hit the nail on the head. At that time, it was much more prohibitive, technologically speaking, to build a convincing simulation. So you needed to attack the authenticity challenge from other directions. Anything ancillary to the experience, especially audiovisual, became extremely important because those were easier ways, relatively speaking, to get the feeling of accuracy and authenticity across. And WRC is a prime example of that. Obviously I'm a very nostalgic person, so I kind of miss those days. But that said, I don't think things are all bad now. Obviously, simulators attain a physical realism now that was unimaginable at the time WRC released. But I think the genre today could learn from the ambition developers like Evos had, to throw in those winks and nods to fans, and boost the experience around the racing to really drive home the immersion. VBR and Lilium like this. I was a big fan of this WRC series on the PS2. Countless hours of fun was had by me, fond memories of the games now. VBR and paulpg87 like this. I remember getting both WRC and WRCII from my uncle, and after completing the 1st, WRC II was the game to play with my pals. those good old days of selecting to 4 players to play a rally, and we all would compete the whole afternoon. Plus the menu music just screams wrc to me. glassjaw and VBR like this.